Nitroproston (11(S),15(S)-dihydroxy-9-keto-5Z,13E-prostadienoic acid 1?,3?-dinitroglycerol ester) is a novel prostaglandin-based compound with potential application in obstructive respiratory diseases such as asthma and obstructive bronchitis. Its pharmacological activity is provided by combined multi-target action on prostanoid EP4 receptors and soluble guanylylcyclase. Nitroproston is bearing a prostaglandin E2 (PGE2) moiety modified by an additional NO-donating fragment of glycerol-1,3-dinitrate (1,3-GDN) via ester bond and can be consider as nitrated derivative of glycerol ester of PGE2 ? the natural COX-2 metabolite of endogenous cannabinoid-like molecule 2-arachidonoyl glycerol. 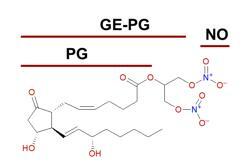 The presence of NO-donating fragment extremely changes pharmacological properties of PGE2. Nitroproston is more than 20-fold as active as prostaglandin E2 in the relaxation of respiratory muscles. Due to this enhanced myorelaxant activity Nitroproston is well tolerated by asthmatic subjects and is the first-in-class pharmaceutical candidate for therapy of asthma attacks utilized both prostanoid and NO receptors. Despite the fact that Nitroproston has been extensively studied using various pharmacological models, its biological stability is still unknown. Thereby, the main aim of the present study was to evaluate Nitroproston stability in vitro, as well as to identify and characterize its biodegradation products. The principal in vitro biodegradation products of Nitroproston were identified using liquid chromatography/ion trap – time-of-flight mass-spectrometry (LC-HRMS/MS). The postulated structure of metabolites was confirmed using authentic reference standards. Rat, rabbit and human plasma and human whole blood samples were used for comparative in vitro degradation study. Nitroproston and its biodegradation products in biological samples were measured by target liquid chromatography/triple-stage quadrupole mass spectrometry (LC-MS/MS). LC-HRMS/MS of spiked rat plasma samples clearly indicated the presence of two main metabolites of Nitroproston – 1,3-GDN and PGE2, the later can undergo dehydration to cyclopentenone prostaglandins. The applied LC-HRMS/MS screening method did not reveal the presence of biodegradation products of Nitroproston with one nitro-group or PGE2 glycerol ester. We assume that nitrate esters are more resistant to enzymatic hydrolysis in rat plasma than carboxyl ester moieties. Target LC-MS/MS quantitative analysis was used to quantify the amount of Nitroproston and its major biodegradation products in rodent's plasma. The degradation was higher in rat plasma where only 5 % of parent Nitroproston was identified at the first moment of incubation. Similar pattern was observed for rabbit plasma where half-life (T1/2) of Nitroproston was about 2.0 minutes. Additionally, whole human blood and plasma samples were taken to perform stability and blood cell distribution study. Nitroproston biodegradation rate for human plasma was the slowest (T1/2 = 2.1 h) among tested species, but occurred more rapidly in whole blood (T1/2 = 14.8 min). Nitroproston was distributed between human RBCs and plasma with partition ratio of 0.82. These data suggest that metabolism of drug candidate in human whole blood was mainly associated with an enzymes located in RBC fraction. The observed interspecies variability highlights the need of suitable animal model selection for Nitroproston follow-up PK/PD studies. Our findings do not exclude that Nitroproston may be relatively stable in human after inhalation and may exert its therapeutic actions either as a whole drug molecule or as a prostaglandin E2 and nitric oxide prodrugs thanks to its active metabolites. Nitroproston is being developed as a drug candidate for relief of bronchial asthma. The key principle of the action of Nitroproston is not only the effect on two targets having similar pharmacological activity with respect to bronchial smooth muscle, but also the synchronization of the pharmacological activity when the prostaglandin E2 is the driver of the donor part releasing the NO in the activity sites. Due to this, a powerful synergy of pharmacological activity is achieved and the dose of PGE2 drops sharply, which brings us back to the possibility of starting new and more successful attempts to use the of NO donating PGE2 derivatives for relief the bronchial asthma.